roundtable. Lloyd Knight, Principal Dancer of the Martha Graham Dance Company, will perform at the event. the Institute for Research on Women, Gender, and Sexuality, and the Center for Jazz Studies. To access Faculty Room, enter the building via the main campus entrance. Faculty Room is located directly beyond the Rotunda. 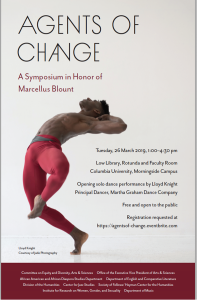 Agents of Change: A Symposium in Honor of Marcellus Blount.